Sonie Desir graduated from CLM in December 2010. She, nine children, and one grandchild live with her husband in Tijedi, a corner of east-central Boukankare. It was similar to the poverty she had known growing up. She was raised by her mother without her father’s support. 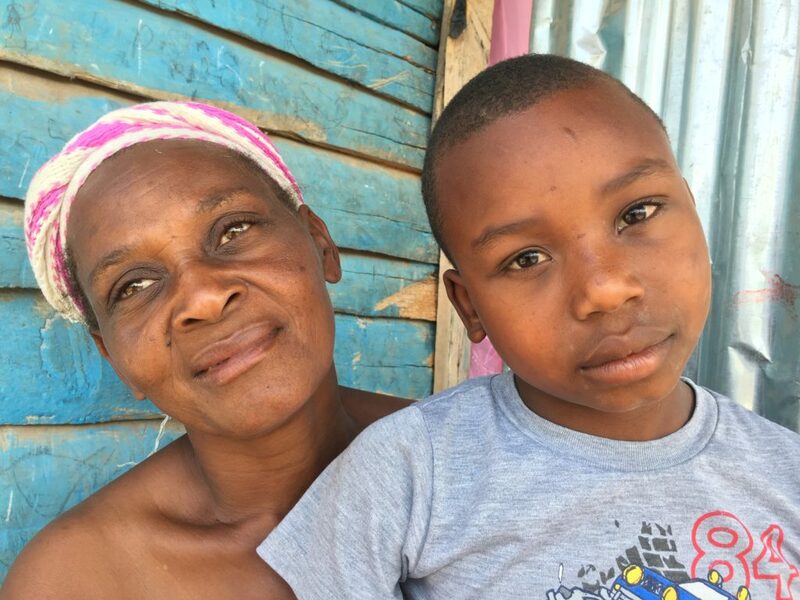 The older woman counted on selling day labor to feed Sonie and her brothers and sisters. If she was able to find work one day, her children would eat a meal the next. After she graduated, she joined Fonkoze credit, and she remained in it for three or four cycles. She doesn’t remember exactly how many. But she didn’t like the program, and she eventually dropped out. “I don’t like getting mixed up with the State.” She knows perfectly well that Fonkoze isn’t a government office, but for her — and for many rural Haitians — “the State” includes anything with the smell of officialdom. A structured office with computers and paperwork and official-looking staff is an uncomfortable place. It can feel as though it’s part of the same apparatus that includes courts, police, and even prisons. A structure that seems in place to take, rather than to support. Her husband’s ability to contribute to the household has deteriorated over the years. Fishing was always a hard business, but according to Sonie it got much worse as groups of thieves learned to steal a fisherman’s catch while he is in the water, fishing for more. Her husband was earning less and less from his work until he finally gave up. He hasn’t taken down his net from where it hangs in the shrubs next to their home in a couple of years. For several years after Sonie was part CLM, she ran a small business, actually a series of businesses. She tried several different ones, but her capital eventually dried up. She’s had trouble with her livestock as well. While she was in the program, she kept goats and poultry. She was able to increase, initially, the number of goats she owned, but some of them died and she sold the others off, one by one. They had become her principal way to pay for her children’s schooling as her husband’s fishing income and then her small commerce dried up. She now has just one. There is also a small pig in the yard. It belongs to one of her boys. Her husband helps now and then by driving a motorcycle taxi. He doesn’t own one, so he looks for drivers who need to take a day off, so he can rent their motorcycle. He and Sonie also look for labor in neighbors’ fields. It can help them pay off the merchants that sell them groceries on credit. Even in the face of daily struggles, the couple has achieved a lot since Sonie graduated. They were living in the one-room house that they built with help from CLM, but it was on a small plot of land that they rented. Paying rent every year was a drain on their resources. They finally were able to put a down payment on their own plot of land. It’s an eighth of a hectare, with plenty of space for their new, larger house. They’ve planted several rows of coconut trees. “We like coconuts, and they give you something you can sell at market to but food.” They’ve also begun planting plantains an other staples. They\ve paid 22,500 gourds so far, and they owe another 15,000. 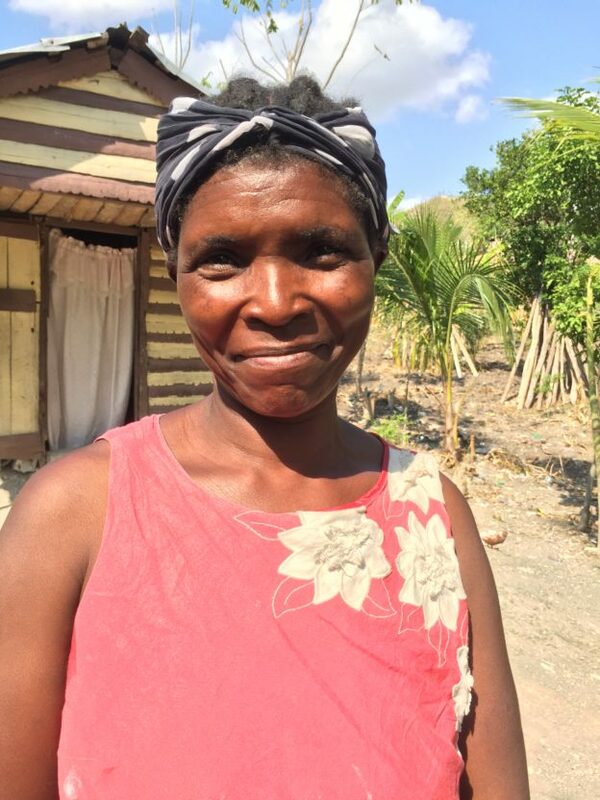 Just south of Sonie, over a couple of small hills, lives Andrémène Raphaël, a mother of five. Like Sonie, she has moved since she was a CLM member. As part of the program, she had built a one-room house on a rented plotted of land, but when her husband died, his family gave him a small piece of land for her to live on with the children. She built a slightly larger house on it with the family’s help, and that’s where she now lives. She no longer pays rent. Only the three youngest children live there with her. Her oldest daughter is married and lives in Pòtoprens, and her second lives with an aunt in Mibalè. The girl moved to Mibalè in 2010, shortly after Andrémène’s husband died. The family thought that they would help out by taking one of the kids and sending her to school, but Andrémène goes to see her frequently. Her husband died during her last months with the program. After the funeral expenses, she struggled, depending on support from her family. In 2012, she took to managing expenses for her and her children with a small business selling basic groceries, but she just couldn’t sustain it. “All the little household expenses in a home without a father” were too much. But as a CLM member, she learned to take care of goats, and she still has one nanny-goat. Her boy has one that a neighbor allows him to take care of. When that goat has offspring, the boy will get a kid as payment. Andrémène makes sure that both goats get attentive care. They are tied in a shady area near their home, and she and her boy bring food to them. That still left Andrémène needing a steady income. She needed a way to keep the children fed and handle other smaller needs. So she sought and found families willing to hire her regularly as a laundress. Laundry in Haiti is hard and time-consuming work, and a family need not be especially wealthy to hire someone to do, or at least to help do, theirs. Andrémène’s clients are in Mibalè, the closest large town, and they generally hire her for large loads. She goes three days per week. Her pay typically depends on the amount of soap required, and her clients’ clothes usually need six to eight bars, plus powdered detergent. She earns from $18 per week to twice that. Of course, if she is sick or she has something else that keeps her from work, she earns nothing. This entry was posted in After Graduation, Chemen Lavi Miyo on March 24, 2019 by Steven Werlin.